Please pay attention. This is an official announcement. Remain vigilant until the crisis is over. It has been reported that a hominid throwback, a possible extant female specimen of Australopithecus Africanus, has been spotted in London, England. Contrary to received scientific wisdom, the overgrown female was found to be capable of complex yet crude vocalisations, which have for many years revolved around stereotyping and insulting white Homo Sapiens, who have provided the female with a comfortable living and quarters in which to nest and rear its offspring. Now however, it seems that the time for its aggressive pant-hooting may be drawing to a close, following its maladroit handling of electronic technology (hardly surprising given that Australopithecines are not thought to have been capable of producing tools). Very well then, enough of the sarcasm for now. Abbott may be a member of the same species, but she has certainly spent the whole of her political life making a career out of nothing more than her blackness. She truly is, in the literal sense of the phrase, a professional black woman; she is professionally black. Take away her blackness and she’d have little to prattle about; she would be no more remarked upon than any other pseudo-socialist hypocrite who prescribes sub-standard state education for all, whilst sending their own children to private schools. 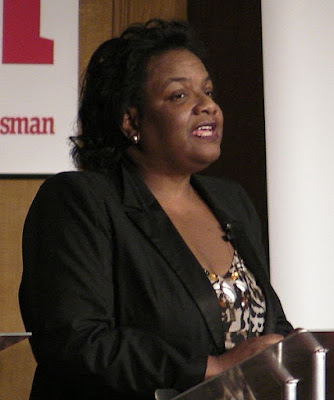 Some might say that Diane Abbott could be described as a professional black female hypocrite; a hypocritical female black professional, or indeed, a black female hypocritical professional. I wouldn’t like to say whether any of these statements happened to be true or otherwise, but one thing I know that she is not is this: an impartial politician who views whites and blacks equally. Diane Abbott most certainly is partial, and she is partial to blacks, as well as being a casual hater of whites. Why then the surprise surrounding her Tweet "White people love playing 'divide and rule' We should not play their game #tacticasoldascolonialism"? She has after all, previously made disparaging remarks about “blonde, blue-eyed Finnish girls”, claiming that she found them unsuited to nursing because they had "never met a black person before”. If you were recovering in hospital, who would you rather meet: someone such as Kiira Korpi or Diane Abbott? I know which of the two types would put the joie back into my vivre and get me swiftly onto the road to recovery, and it wouldn’t be some sullen white-hater originating in the tropics. As for Abbott’s Tweet, does she not find it a little ironic that she herself has based her career entirely upon ‘divide and rule’? She seeks to corral black voters into a bloc that she then claims to represent, and this she has done most successfully in Hackney since 1987. Abbott is a race obsessive, and without her ugly politics of negritude victimhood and perpetual resentment, she would have no political platform and would have had no public career. Isn’t it time that this repulsive anti-indigenous anti-white politics was buried once and for all, along with the careers of its trailblazers Diane Abbott and Ken Livingstone amongst many others? Dotun Adebayo and Yasmin Alibhi Brown may have voiced their continued support for 'black' sectional politics and Diane Abbott on Radio 4 in a discussion with Justin Webb, but it needs to be made clear that if they continue to agitate upon the basis of race, then we whites have no alternative but to countermobilise along racial lines to secure our rights and interests in our own land. I can say nor do more than this. Thank you very much for the link Oldrightie. I'm glad that this piece struck a chord. Excellent post - I completely agree with everything you've said about that nasty old racist bloater.